We spend most of the time quit a bit of money on a nice grill and sometimes forget that we have to maintain it also. 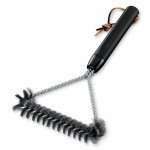 The use of a quality grill brush can make cleaning the grill grates a lot easier. Let’s be honest we all like to grill but cleaning is most of the time not our favorite thing to do. With a good grill brush this can be done a lot faster. 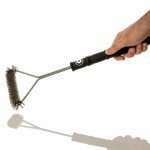 Weber is known for their quality and this 6494 grill brush is no exception. With an average rating of 4.5 from 475 buyers and the only bad thing I could find was that was no to use on porcelain grill grates. According to one buyer it damaged his grates. The bristles seems to shed a little after a heavy use, but I think most grill brushes do that. All together a good product for a reasonable price. “I LOVE this BBQ brush! The design makes it easy to use, and easy to scrub, if necessary. Whether the grill is hot or cold, this brush works like a charm. Hands down, this is the best BBQ accessory that I own. Don’t debate any further… BUY IT! You won’t be sorry. Could not find a brand name for this grill brush, but with almost 350 buyers and a rating of 4.8 I am not to concerned about that. This grill brush claims to be safe for porcelain grill grates. The stiff bristles will do a good job and will last a long time. 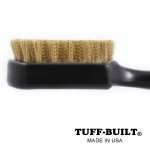 This grill brush, although no brand, got some great reviews and we can only recommend it highly. 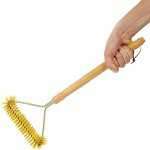 “Bought this to use with my new grill and so far scrubs great, not sure what more I can really say about a scrub brush. One thing I like so far is it has not damaged the ceramic coating on the grill plates and I scrub them hard after every use. Fits comfortably in my hand. Nice grill brush for a low price. Bristles come of fast and the shorter handle seems to be a little annoying. Fits good in corners and cracks of the grill. Although it only receives a 3.7 star rating, most buyers like it. Not really a brush that will last for years and years. If you are not a heavy griller, this grill brush is a good by. If you grill a lot I suggest looking at the other review for a grill brush that will last a little longer. Brass bristles have for a long time been the best for grill brushes. Many manufacturers changed to steel bristles, so if you are looking for a quality brass grill brush this is a great deal. With an average of a 4.6 stars from over 380 buyers we can recommend this as a good buy. Remember however that brass is a lot softer and you can not put as much pressure on it. If your grill is real dirty use a cheap metal brush first and finish with this brass wired grill brush. This is a made in America product and received a 4.5 rating from 240 buyers. As always there are people who are not happy and this is what I found from a few more negative ratings. The bristles are shorter than expected. There is no lanyard to hang it on the grill. Other than that there were no complaints about this brush. Think this is a good buy for the more heavy griller that needs a little more sturdy grill brush. “I was looking for a replacement brush from my old Weber wood/brass brush and since this was the top selling unit on Amazon I decided to give this a try. And wow how much better this brush works. It takes far less effort than my old wood/brass brush because of the steam generated and the leverage for the angle design. It is big and made of cheap plastic, so storing is somewhat problematic as it too big for a kitchen drawer and too ugly to hang. I do think it is a great gift idea for anyone that grills because it works so well. This grill brush works like a miniature steam cleaner when used as directed. Use only on a hot grill. Fill the handle with water and use it on a hot grill. The steam will help clean on and in the grill grates easier. One of the best things is that it will keep the bristles cleaner because of the steam. One of the most important tips we could find is to be very careful when you have porcelain coated grill grates. 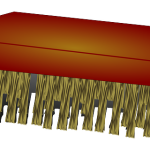 the use of grill brush with stiff steel bristles can damage the coating on the grates. The use a brass grill brush is advised. Don’t spend a lot of money if you are just using your grill once in a while. Any cheaper grill brush will do good than. Buy a quality one if you are a heavy griller that does need to do a lot of cleaning of the grill grates.